A 29-year-old female presents to the emergency department with sudden onset severe chest pain. The patient has no relevant past medical history or prior imaging and has no primary care physician. 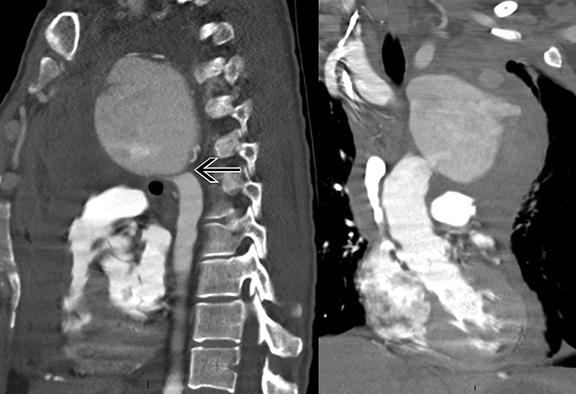 Contrast-enhanced CT images show an 8 cm saccular thoracic aortic aneurysm with active extravasation, hemothorax and hemomediastinum. In addition, there is a severe juxtaductal aortic coarctation with numerous well-developed collaterals (Figures 1-4). Aortic coarctation with secondary ruptured thoracic aortic aneurysm, active extravasation, hemothorax, and hemomediastinum. Differential diagnosis includes pseudo-coarctation of the aorta and Takayasu arteritis. In the early 20th century, coarctation of the aorta was largely a diagnosis made at autopsy as physicians were hardly aware of the condition.1 The first surgical correction of aortic coarctation was performed in 1945. Soon thereafter, surgery became the treatment of choice. Campbell described the natural history of untreated coarctation in 1970,1 which supported the surgical approach. Historically, when aortic coarctation is untreated, the median age of death was 30 years. The leading causes of death included: heart failure (25 percent), ruptured aorta (21 percent), bacterial endocarditis (18 percent), and intracranial hemorrhage (12 percent).1 In addition, other sequelae related to chronic hypertension, such as coronary artery disease, stroke and aortic dissection can also develop.2 This case seems unusual since today most people with aortic coarctation are diagnosed and treated at a young age. However, when left untreated, death at 29 years of age from a ruptured aneurysm is not unexpected. 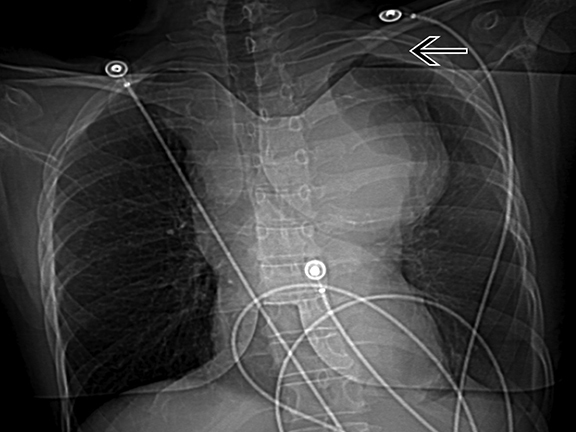 Similar cases have been published3,4,5 with involvement of the ascending and descending thoracic aorta. The radiologist may be the first person to detect an undiagnosed coarctation on a chest radiograph. Classically, there are dilated, tortuous intercostal and internal mammary collaterals that pulsate on the undersurface of the ribs, causing (by age 5) subtle rib “notching”.6 The contour of the aorta may be indented at the level of the coarctation creating a reverse “3” sign, with or without post-stenotic dilatation; and left ventricular hypertrophy can create a rounded cardiac apex. An echocardiogram may occasionally miss a focal juxta-ductal or post-ductal coarctation, while the longer-segment pre-ductal infantile type is more readily seen. On MR or CT, the precise location and anatomy of the coarctation and associated collateral vessels are well demonstrated. ECG-gated studies better demonstrate associated cardiac findings, such as bicuspid aortic valve, left ventricular hypertrophy, and ventricular septal defect.8 The American Heart Association recommends treatment when there is a pressure gradient of 20 mm Hg or greater, or the presence of significant coarctation with significant collateral flow, with or without a 20 mm Hg or greater pressure gradient. Aortic coarctation has signs and symptoms and radiographic findings that are diagnostic. On rare occasion, the diagnosis is not made during childhood and the patient is at risk for significant complications and possible death at a young age. The treatment of choice is currently surgical repair and long-term follow-up. Campbell M. Natural history of coarctation of the aorta. British Heart Journal 1970;32:633-640. Cohen M. et al. Coarctation of the aorta: Long-term follow-up and prediction of outcome after surgical correction. Circulation 1989;80(4):840–845. Heper G, et al. Clinical and hemodynamic follow-up of a patient after operation for dissection of an ascending aortic aneurysm secondary to coarctation of the aorta. Int Heart J; 2005:46(6):1123-1131. Narin C, et al. Repair of coarctation-related aortic arch aneurysm and ventricular septal defect in an adolescent. Tex Heart Inst J. 2008;35(4):466-469. Celik T, et al. A large calcified saccular aneurysm in a patient with aortic coarctation. Int J Cardiovasc Imaging. 2006 Feb;22(1):93-95. Rosenthal E, et al. Coarctation of the aorta from fetus to adult: Curable condition or life-long disease process? Heart 2005;91(11):1495-1502. Jurcut E, et al. Coarctation of the aorta in adults. J Med Life. 2011;4(2):189-195. Kimura-Hayama E, et al. 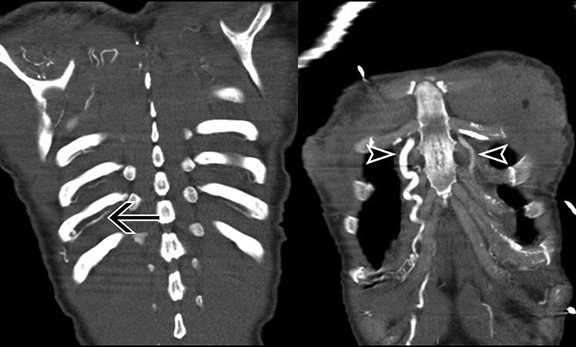 Uncommon congenital and acquired aortic diseases: Role of multidetector CT angiography. RadioGraphics. 2010;30(1):79-98. A fatal case of undiagnosed aortic coarctation. Appl Radiol. Prepared by Dr. Dance, Dr. Keehn, Dr. Peterson, Dr. Jorgensen, and Dr. Richard Towbin, while working with the Department of Radiology at Phoenix Children’s Hospital, Phoenix, AZ; and by Dr. Alexander Towbin working with the Department of Radiology at Children’s Hospital Medical Center Cincinnati, Cincinnati, OH.